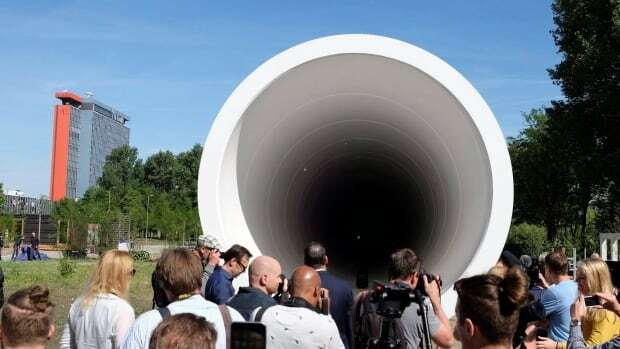 Transport Canada says it will evaluate so-called ‘hyperloop’ technology — a prototype transportation system meant to move people and freight at very high speeds through a sealed tube. Is the technology viable and safe for passengers and nearby communities? How do its costs compare with conventional high-speed rail? North American firms working to develop the technology — such as the Canadian company Transpod — say they welcome the study. Transpod’s co-founder Sebastien Gendron said from his Toronto office that the Canadian government has been “quite shy” when it comes to considering hyperloop as viable transportation technology. Hyperloop tech is still at the prototype stage; there are no commercial hyperloop systems in operation anywhere. Unlike trains, hyperloop systems don’t use rails. Instead, they propel vehicles through vacuum in sealed tubes at speeds that can exceed 1,000 km/h — speeds made possible by the extremely low friction inside the tube. In theory, a hyperloop vehicle could whisk you from Toronto to Vancouver inside of three hours. Transpod’s other co-founder, Ryan Janzen, said hyperloop “has a chance to displace a huge amount of road traffic.” He said his company could build an Ontario to Quebec loop that would run three times faster than high-speed rail, but at a comparable price. Ryan Kelly is head of global marketing and communication for Virgin’s Hyperloop One, which is testing a hyperloop system. He said it’s promising that Transport Canada is taking the lead. He said his company met with officials from Innovation, Science and Economic Development Canada and Quebec’s provincial minister for innovation in January at the Consumer Electronics Show in Las Vegas. Kelly said he believes Transport Canada’s tender represents the first attempt by a Canadian government to take a close look at hyperloop technology. Hyperloop’s proponents, he said, make many promises about a cheaper, faster and more environmentally friendly form of transportation that requires less expropriation of land than new passenger rail projects. “What Transport Canada is trying to do is find out if are these claims correct,” Kelly said. Kelly said a commercial hyperloop system is years away, not decades. Ottawa’s study, he said, puts Canada in a position to be among the first countries to establish hyperloop regulations, fund research and acquire transportation corridors. “Why aren’t we going to technology that exists for half a century that is proven and safe?” Lagnan told CBC. “It doesn’t make sense. Transport Canada said in a statement that it’s merely trying to get ahead of the curve on what could turn out to be a game-changing technology.